How to speed up a video? 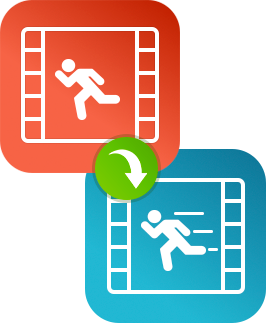 Video acceleration is often used in movies and TV shows to create a comedic effect. You can also apply a fast forward effect to long scenes in your movie to reduce the total time. It’s particularly helpful in instances where you want to show the whole scene but don’t want to make the movie overly long. You can use the Movavi's video speed changer to easily control the speed of your film. 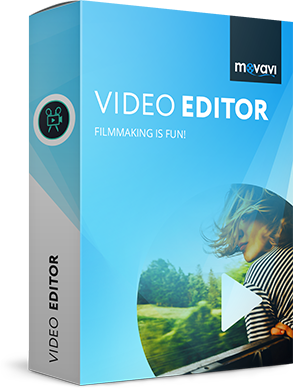 Movavi Video Editor is an all-in-one video editing tool that you can use to create your own movie, complete with special effects, music, and title text. Creating fast forward videos is really easy. Just follow this quick guide and see for yourself! 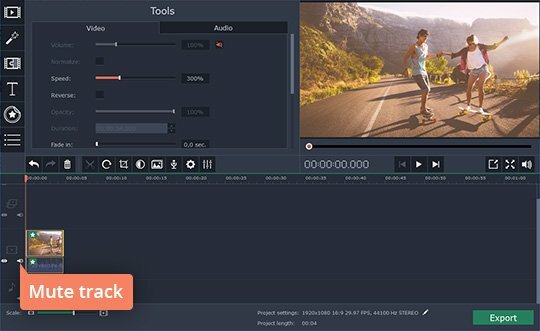 Download our video speed editor to your computer, launch the setup, and follow the installation instructions. Start the app and choose Create project in full feature mode. After that, click the Add Media Files button, and locate the existing video file you want to speed up. The video you’ve chosen will be automatically added to the Timeline at the bottom of the program window. 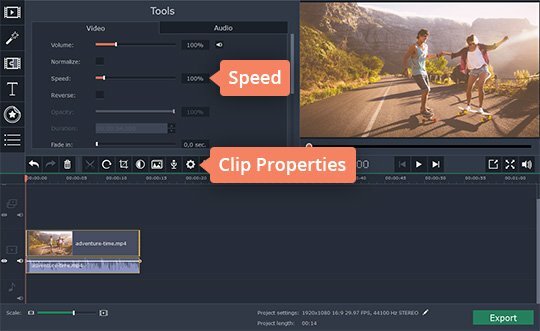 To increase the video speed, click the Clip Properties button and move the Speed slider to the right. Experiment with the slider to set the optimal video speed-up rate. When you change the video playback speed, the audio speed also changes. 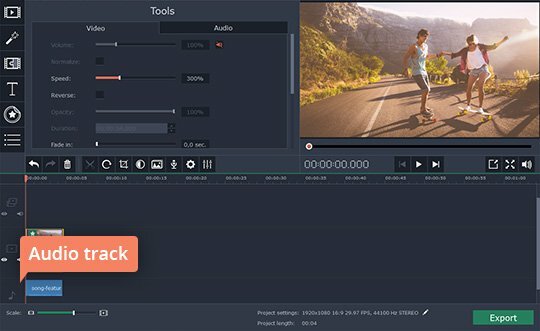 If you want to speed up only the video sequence, keeping the original soundtrack speed, here’s how to do it. First, mute the original audio. To do this, click the Mute track icon as shown in the screen image. Upload the original video to the program one more time. Click on the audio under the video clip, drag it to the Audio Track, and place it below the original video clip. Then delete the video you’ve just added. Now you have the accelerated video with the original soundtrack. You can also add a completely new audio track to your speeded-up scene – check our guide to adding audio to video for more information. 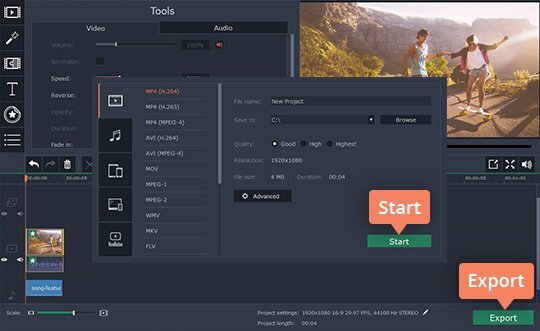 You can save your final video in any popular video format (MP4, AVI, WMV, MPEG/MPG, etc.) and prepare it for uploading to the Web, for viewing on a mobile device or even on an Ultra HD TV. Click the Export button and choose your preferred option, for example Save Video File or Save for Devices. Then choose your desired video format or device model and click Start. The program will save the movie to your computer’s hard drive, in the folder you specified. 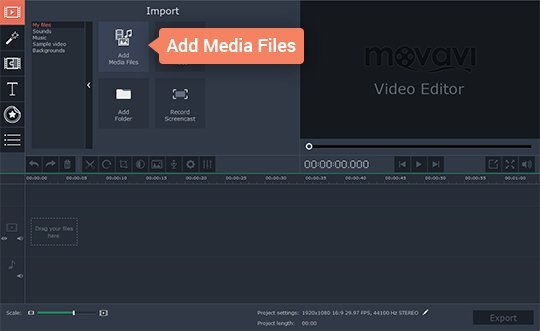 Now you know how to use Movavi Video Editor as a video speed increaser!